1. Rate cut in China: China's central bank cut interest rates over the weekend and stock markets responded by catapulting higher. The China Shenzhen index surged by 4.5% and the Shanghai Composite index jumped by 3% on Monday. This is the third rate cut in the last six months. 2. Earnings: Dish Network (DISH), Mobileye (MBLY) and Sotheby's (BID) are reporting ahead of the open. 3. Global economics: The Bank of England releases its rate decision Monday. Monetary policy in the U.K. has been very loose for a long time, but economists expect the central bank will eventually begin tightening the screws. The British economy is improving so "it will be difficult to think of a situation why the monetary policy should remain at current level[s]," said Naeem Aslam, chief market analyst at AvaTrade. Eurozone finance ministers are meeting Monday to decide whether to help Greece by giving the indebted nation more loans. Investors continue to worry that Greece could soon default on its debt. The country has to make a €750 million ($838 million) debt repayment to the International Monetary Fund on Tuesday. 4. Stock market overview: U.S. stock futures are moving sideways, indicating it could be a quiet start to the day. European markets are mixed in early trading. The French CAC 40 index was the main decliner -- off by about 1.5% -- as Airbus (EADSF), AXA (AXAHF) and Sanofi (GCVRZ) dragged the index down. Shares in all three companies were dropping by roughly 4% to 5% each. 5. Friday market recap: The stock market closed out the week with some solid gains on Friday. 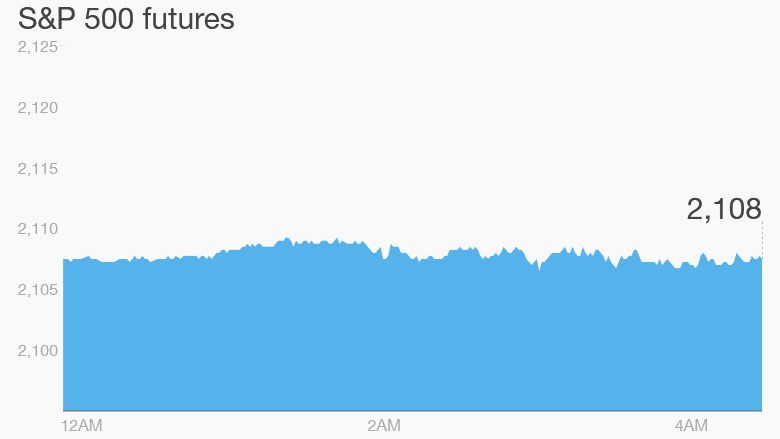 The Dow Jones industrial average shot up by 267 points, the S&P 500 rose 1.4% and the Nasdaq closed with a 1.2% gain.